Let’s just be totally honest here. I love American food just as much as anyone else such as hamburgers and French fries, Mac and Cheese, where the cheese just connects your fork to the plate it is so stringy and gooey, and pizza. So when I saw a recipe where all these flavors were mixed together in one skillet I was a bit skeptical. I mean is this like a “Clean out the fridge and see if anyone notices.” Kind of a recipe? The answer to that is NO! This literally where you cook everything using only one pan, wave your magic wooden spoon, and smell the magic happen! I should have known this would be amazing when I saw it had bacon in it. Now the biggest hurdle is to see if my family loves it. 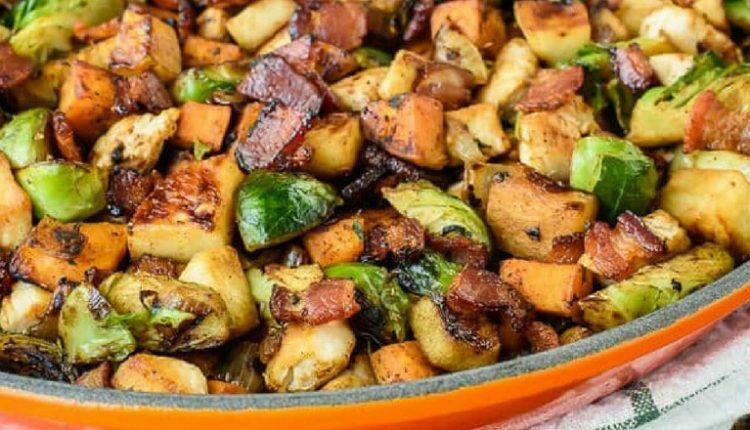 The apples and Brussel sprouts are perfect cooked this way, which is a huge deal for me. I am not the biggest Brussel sprout fan, but my family just could not get enough of this once I put it one the table. In fact, they already asked me to put it on the menu again and want me to make a double batch so we have enough for lunch left-overs. This is what Erin of Well Plated has to say about this healthy dish. Quick Tip: This meal stays good for three days in fridge but when reheating you may want to add a bit more chicken broth to keep from drying out.